Among all the Yangtze River cruise ships, are you looking for the cheapest ship to spend your up-coming holiday in China? We China Discovery has listed the top 5 cheap Yangtze River cruises that offer very good price this year, but also provide great services, full equipment and facilities, various kinds of recreational activities, and have received active reviews from our guests. Check the detail of each budget cruise ship as below! 1. Century Sun & Century Sky, only from $396 - $469. Outstanding Management of European-form: Century Sun & Century Sky has introduced the advanced concept of management and service of the Viking Cruises from the Europe, therefore, travellers onboard the cruises can enjoy the international standard services from the staff to be really satisfied through the trip. Dining Suits Western People: having served a great number of western guests for many years, the cruise managers perform very well to prepare delicious food and drinks suit the needs and habits of Western people to satisfy their taste buds. Large Space for Public Activities: onboard Century Sun and Century Sky, people can be completely entertained by the lots of activities and cultural lectures and will not be bothered by the crowded, which is due to the very large per capita public area considered by the cruise company. Check more detail information about Century Sun and Century Sky! 2. Victoria Katarina, only from $382 - $469. Praised American Services: Victoria Katarina is under the American managed Victoria Cruises, so visitors especially people from the America, Europe and Atlantic areas can be taken good care of with the highly praised services during the tour onboard. Newest Yangtze River Cruise: it is the newest Yangtze River cruise ship as it has been refurbished in April in 2014, which gives guests a wonderful new experience with the brand-new facilities, amenities and decorations from the public area to the cabins. First Experience of World Largest Ship Lift: you can experience the Three Gorges Dam ship Lift that is the world largest and most complicated ship lift system for free if you book Victoria Katarina in 2017. Entertainments without charge: people can enjoy a lot of happy time with the well prepared entertainment activities, performances, and cultural lectures without extra charge. Check more detail information about Victoria Katarina! 3. President No.6, only from $386 - $436. Cabins Equipped Well: great equipment and amenities are fully prepared in the cabins and suites, such as the cozy beds and bedding articles, Televisions, air conditioners, private balconies, private bathrooms with showers, 24-hour hot water, active windows, and so on. Travellers will feel very comfortable to spend their time onboard. Activities for Free: apart from the arranged shore excursion sites along the river, you can enjoy a wonderful time since there are diverse activities and shows well prepared by the crews, so you can learn more about Chinese culture and history and make friends with others and will not feel bored but only happy and relaxed along the trip. Check more detail information about President No.6! 4. Yangtze 2, only from $386 - $449. Budget New Vessel: constructed in 2011, Yangtze 2 is comparatively new, and since it offers the very low price of only from $419 - $464, this ship will be an ideal choice for people who plan a cruise according to the budget. Standard Facilities: grand lobby, spacious dining places, sightseeing elevator, bar, café, indoor heated swimming pool, reading area, chess & card room, gym, standard conference center, large sun deck, well-equipped cabins and suites, and so forth are offered with high standard to benefit the onboard experience of every guest. Popular Ship Star along Yangtze River: Yangtze 2 has been a popular ship star for its rich experience of receiving numerous Chinese and guests from other countries and regions, and to let visitors spend high time on the cruise, they have arranged a series of interesting recreational activities, performances, and cultural lectures for guests of a wide range of ages, from the children to the elder people. Check more detail information about Yangtze 2! 5. Yangtze 1, only from $378 - $431. Bottom Price: Yangtze 1 offers the lowest price of only $392 - $431, and it will be one of the top selections for Yangtze River travellers with limited budged. Sweetly Designed Environment: since a private balcony is prepared in every cabin, people can appreciate the fine view of the Yangtze River without walk out from their room. Besides, sightseeing elevators are also available onboard, so you can get to other decks faster, and it is very convenient for elder guests and people who don’t want to take the stairs. To let you have more time and places enjoying the natural view of the river, the multi-functional hall is equipped with full-height glass curtain walls. Diverse Interesting Activities: people will have many chances to learn know things about China, since rich sorts of activities are offered onboard, like the Chinese costume show, Chinese calligraphic and painting lecture, Tai-chi playing in the morning, etc. Your trip on the ship will be wonderful and meaningful as well. Check more detail information about Yangtze 1! 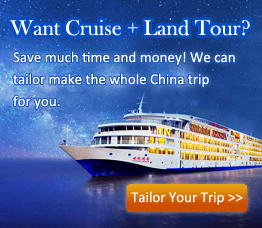 Note: For more detail info of each cheap Yangtze River cruise ship, please feel free to contact our professional Travel Consultant!